Buy Natura Siberica Alladale Nourish & Repair Natural Hand Cream - 75ml in the UK from our online shop or directly from our independent Scottish store. Certified natural, this hand cream contains Wild Thistle, the national flower of Scotland, and wild Organic Siberian Rhodiola Rosea from Natura Siberica’s organic farm in Khakassia. Natura Siberica's Alladale range supports the Alladale Wilderness Reserve in the Scottish Highlands (Scotland). With wild herbs and flowers. We sell real Natura Siberica and other Foot and Hand Care directly from our shop in Scotland and online throughout the UK. View more products from Natura Siberica. Where can you buy real Alladale Natural Hand Cream safely online? If you are wondering where you can buy Natura Siberica Alladale Nourish & Repair Natural Hand Cream - 75ml safely online in the UK, then shop with us. We are an actual health foods shop; with real people selling real foods and products. Our award-winning independent shop is located in Stirling, Scotland since 1976. You can buy our Foot and Hand Care in store or safely place an order with us online or over the phone. 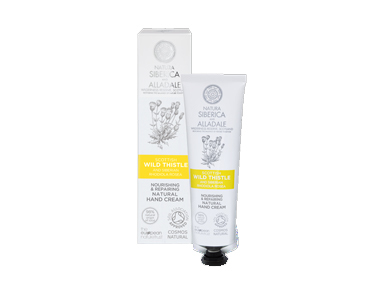 Alladale Natural Hand Cream - Natura Siberica Alladale Nourish & Repair Natural Hand Cream - 75ml in Foot and Hand Care and Personal Care.